Romney Tries To Shape Distinct Iran Policy The Republican presidential candidate says America's national security priority should be preventing Iran from acquiring a nuclear weapon, a point he made directly during a weekend stop in Israel. But analysts say Mitt Romney's policy descriptions sound much like those of President Obama. 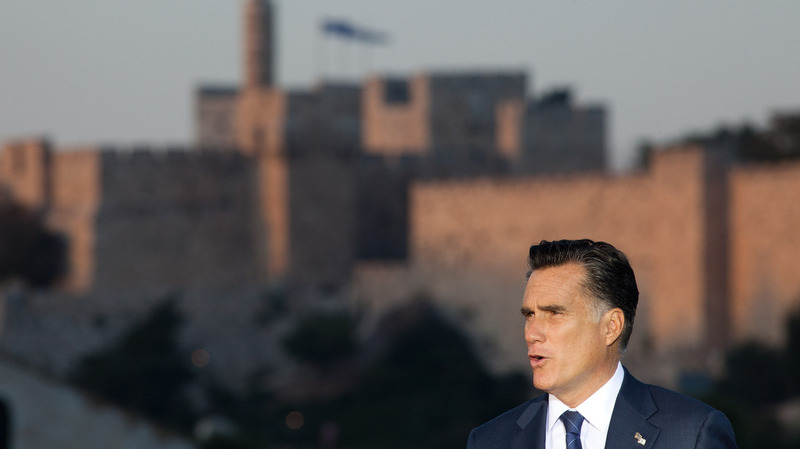 Mitt Romney speaks in Jerusalem on Sunday, backing "any and all measures" to keep Iran from developing nuclear weapons. Republican presidential candidate Mitt Romney says America's national security priority should be preventing Iran from acquiring a nuclear weapon, and he was talking tough about this in his recent stop in Jerusalem. "History teaches with force and clarity that when the world's most despotic regimes secure the world's most destructive weapons, peace often gives way to oppression, to violence, or to devastating war," Romney said. "We must not delude ourselves into thinking that containment is an option." Romney's language sounded a lot like President George W. Bush's on the eve of the Iraq war, says Bruce Jentleson, an analyst with ties to President Obama. But rhetoric aside, the policy prescriptions sound much like Obama in his speech this year to the America Israel Public Affairs Committee, a pro-Israel lobby. "Iran's leaders should understand that I do not have a policy of containment; I have a policy to prevent Iran from obtaining a nuclear weapon," Obama said at the conference. It really would be refreshing if Gov. Romney and President Obama could stand together on this. ... That would show real solidarity. It might even impress the Iranians that we were unified." The West believes Iran is developing nuclear weapons, a charge Tehran denies. Iran says its nuclear program is for peaceful purposes. On Tuesday, Obama announced new sanctions against the Iranian energy sector to pressure Tehran to give up its nuclear ambitions. But this and other foreign policy matters are not expected to be big factors in the presidential election, says Jentleson, a professor at Duke University who is also on the national security advisory committee for the Obama campaign. "There's no crystallizing foreign policy issue in 2012 the way that Iraq was in '08 or 9/11 in '04," Jentleson says. "Even if you go back to 1980 and, you know, the Iranian hostages and the Soviet invasion of Afghanistan. So, there's no single issue that affects the vote." Jentleson says that's why Romney has hit broader themes, trying to portray himself as tougher than Obama. "He's really trying to play this notion of he is very tough and, frankly, I think if you look at the public opinion polls and you just look at the general mood of the country after a decade of war, people don't want a president who is gun shy," Jentleson says. "But they also don't want a president who's too trigger happy." On the other side of the political spectrum, self-proclaimed hawks on Iran see mainly consistency in U.S. policy toward the Islamic republic. "Beyond Romney's rhetoric, there really isn't much there, there," says Michael Rubin of the conservative American Enterprise Institute think tank. Rubin says he'd like to see tougher and broader sanctions on Iran, but Romney has only promised to do a better job enforcing existing sanctions. "If Gov. Romney's main goal is economic discipline, he really does need to explain how his Iran policy is going to be consistent with fiscal discipline," Rubin says. "Simply put, can we afford to be even tougher on Iran than we are right now?" Rubin sees no real differences between the two candidates on this; nor does Harvard University's Nicholas Burns, who worked in the George W. Bush administration on Iran, setting up the current policy of pressure and negotiations. "It really would be refreshing if Gov. Romney and President Obama could stand together on this," Burns says. "I mean, they're obviously going to have lots of differences in the campaign on domestic and foreign policy issues, but on this one if there's no difference in reality, I think it would be refreshing if Gov. Romney would stop trying to make a difference and would stand with President Obama. "That would show real solidarity. It might even impress the Iranians that we were unified. And it would serve the old adage that politics should stop at the water's edge." Burns says that could help diplomats struggling to resolve what he calls the most difficult foreign policy problem facing the United States.